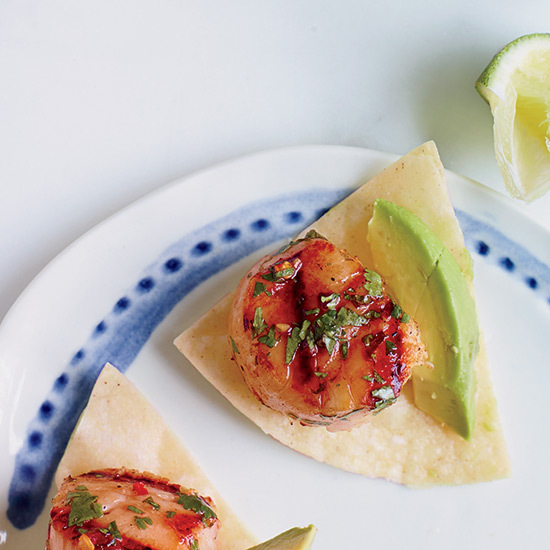 Ready in just 12 minutes, these spicy grilled scallops are an addictive appetizer. In a bowl, toss 1 lb. large sea scallops with 1/4 cup each of olive oil and chopped cilantro, 2 minced garlic cloves, 2 Tbsp. lime juice and 1 1/2 tsp. each of low-sodium soy sauce and crushed red pepper; season with salt and black pepper. Grill over moderate heat, basting with the marinade, until cooked through, 2 minutes per side. Serve with tortilla chips, avocado and lime wedges.